How can we turn our house into a home, sweet home? A house is simply a place where we eat, rest, and we grow up, but a home is a place where we learn to love, to share, to play and to dream. It is also the place where we feel loved and cared for at the same time. Throughout our lifetime, we may transfer houses several times but one thing is for sure, our hearts will always long to come back to our home. As the song goes, “a home is where the heart is”. 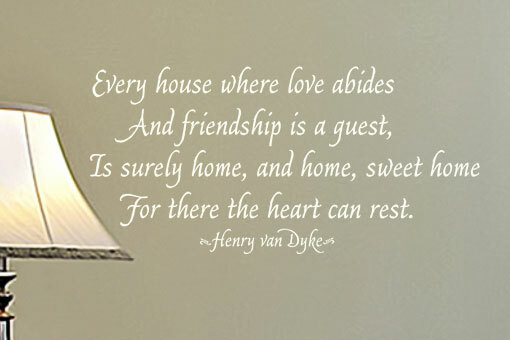 So let’s celebrate the essence of a home, sweet home through this wall quote by Henry van Dyke: “Every house where love abides and friendship is a guest, is surely home, and home, sweet home, for there the heart can rest.” Let your guests feel that your house can also be a home for them. Welcome and inspire them with this wall decal so they will also spread the love in their own homes. The design of this wall quote is in a simple lettering style and arranged like a poetic verse. You may personalize the look by adding some wall lettering art of your choice. Browse through our wall lettering art section and find exactly what you want. You can even preview your design instantly. DecorativeLettering has a wide array of wall quotes about family, love, and friendship. And have the freedom to arrange and design these wall quotes the way you want. 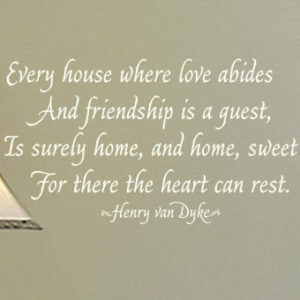 Let your walls speak out that love and friendship are very much welcome in your home.